What a pleasure it is to read a good book by a Canadian author. 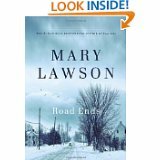 “#Road Ends” by Mary Lawson is set near #New Liskeard in northern Ontario and London, England in the years between 1966 and 1969. Road Ends chronicles the lives of various members of a small town family that includes seven boys and one girl. I could relate not only to the small town setting but also to the descriptions of Megan travelling to England in 1966 when she was 21, as I also traveled to England in 1967 by myself at the age of 20. Road Ends is a fast read but covers a complex set of circumstances and personalities. I had to wait a few weeks for it to become available to download from my local library as it’s a current best-seller but it was worth the wait. The book is well-written, engaging and a genuine page-turner – just what I like. Hope you do too. Ooooh boy – back in my day . . . So glad to hear Mary Lawson has another book out. Sounds like a great read. Thoroughly enjoyed her first book “Crow Lake” and “The Other Side of the Bridge”. I highly recommend them, particularly “Crow Lake” if you haven’t read them yet. I’ve noted it on my “Must Read” list, thanks!